It's been little over a month since the official release of LG's latest flagship phone, the LG V20. Despite a few minor hiccups, the V20 has been attracting attention from all over for being an amazing phone. But like with most Android phones, there's no better feeling than rooting and taking complete ownership of it. Unfortunately, unlike most LG phones, the V20 can't be rooted using the traditional method of flashing a stock TOT or KDZ file via LGUP, which means we'll have to use alternative means to achieve Superuser status. 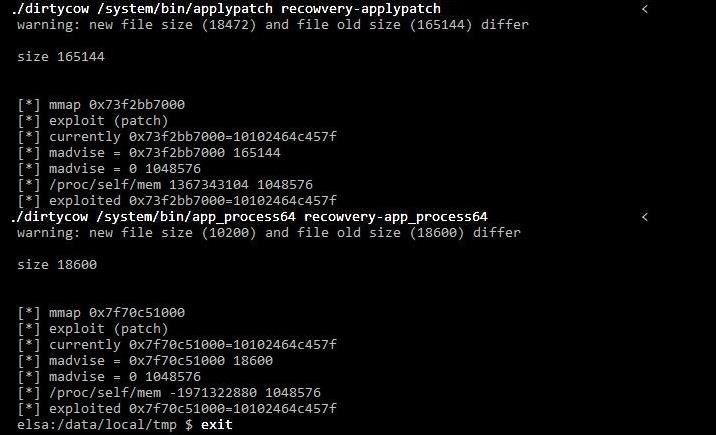 Luckily, though, a new method revolving around the Dirty COW exploit can be used to root the T-Mobile (H918) variant of the LG V20. It'll take a lot of work, and you'll need to make sure to follow every step carefully, but we've got the process covered in detail below. First up, make sure to back up your phone's data before using this method, as it will wipe all data on your device. Most of your apps will be restored when you log back in with your Google account after rooting, but personal files like your photos and MP3 library should be transferred to an external storage drive before you begin. This method utilizes ADB and Fastboot commands, so we'd recommend that you have at least a basic knowledge of these two tools before proceeding. If not, at least make sure to follow the steps perfectly, otherwise you might risk bricking your device. 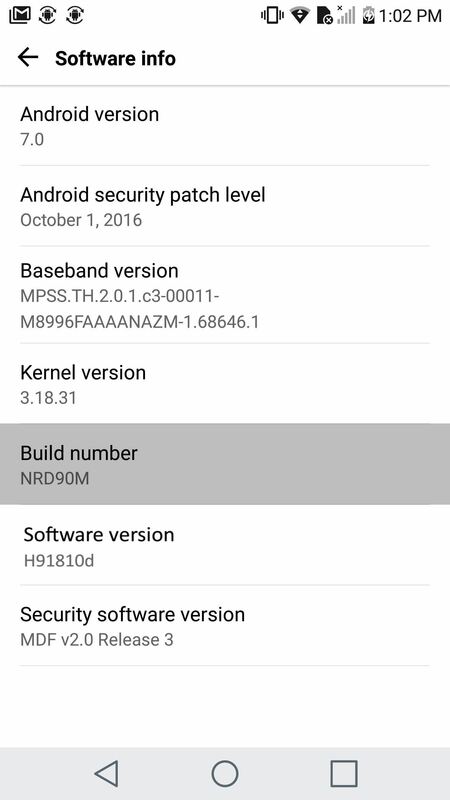 Finally, we have to give a big thanks to XDA Recognized Developer James Addunono for modifying the Dirty COW exploit script to work with the LG V20, and for compiling TWRP, which makes rooting the V20 possible. To start, install the LG drivers for Windows or Mac, as this will allow your phone and computer to communicate with one another. When you're done with that, restart your computer to make sure the drivers are active. 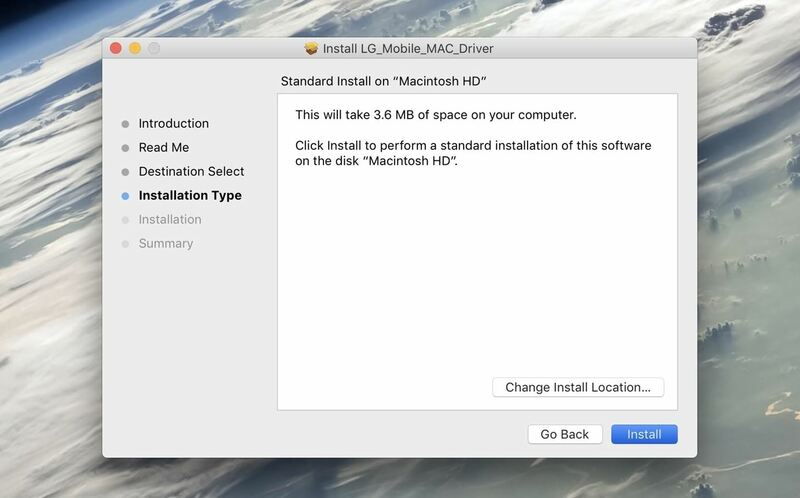 Installing the LG drivers on a Mac. After that, you'll have to enable the hidden "Developer options" menu on your phone. To do that, navigate to Settings -> About phone -> Software info, then tap the Build number entry seven times in rapid succession. Now go to Settings -> Developer options, then turn on the "OEM unlocking" option, and press "Enable" when prompted. 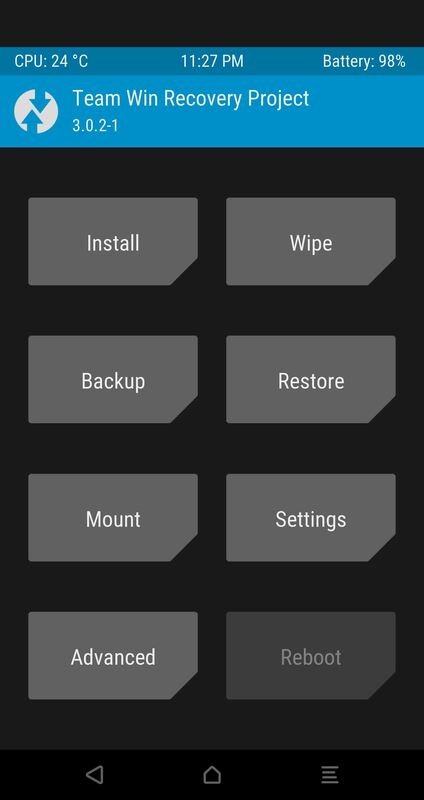 Do not turn this off while using a custom ROM or a custom recovery, as it will result in a loss of your data. 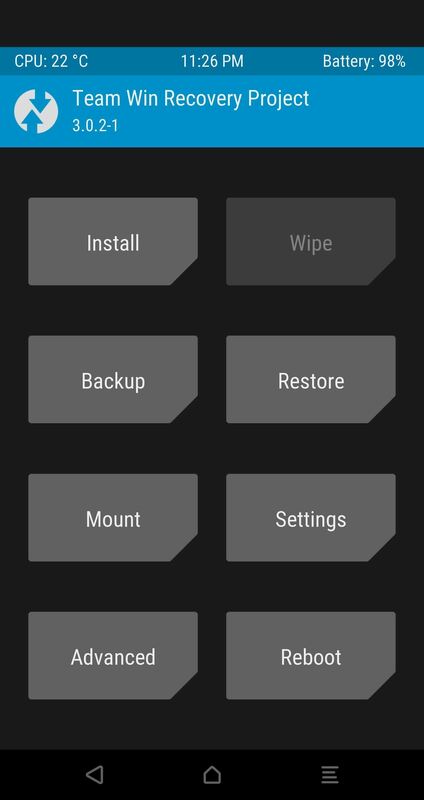 Enabling the "OEM Unlocking" setting in the Developer options menu. 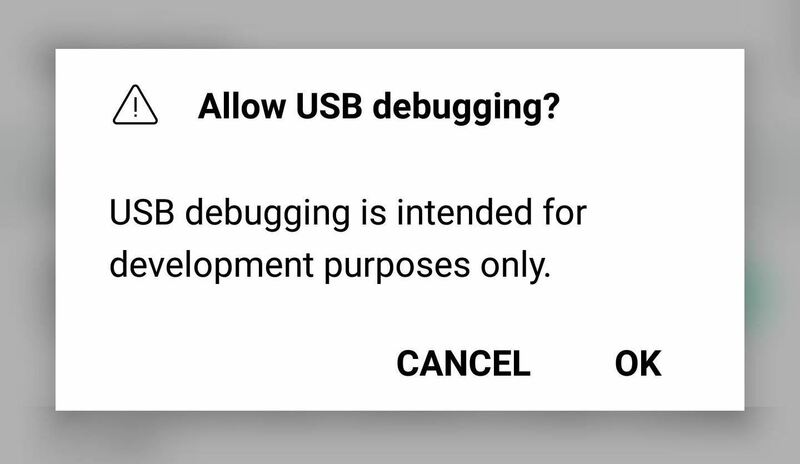 When you're done there, scroll down just a little bit and enable the "USB debugging" setting in the same menu. Next up, connect your phone to your computer with a USB data cable. You might need to put the phone into PTP mode (for transferring images), as LG seems to have messed up their driver configurations. To do that, tap the USB Computer Connection notification that appears after plugging in your phone, then select "Photo transfer" from the popup. Now open the ADB and Fastboot installation directory on your computer. 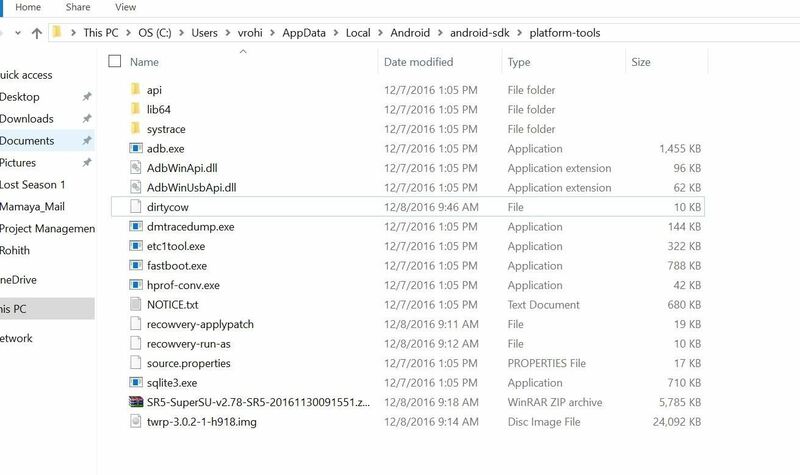 For most Windows users, this can be found at C:\Program Files (x86)\Android\android-sdk\platform-tools. For Mac and Linux users, it depends on where you extracted your ADB folder when you installed the utility, so search your hard drive for the platform-tools folder if you've forgotten. From there, if you're using a Windows PC, hold down the shift button on your keyboard, then right-click any empty space and choose "Open command window here." For Mac and Linux users, simply open a Terminal window, then change directories to the platform-tools folder inside of your ADB installation directory. Opening an ADB shell on Windows. Next, type adb start-server in the command prompt. Once you've done that, make sure to check the notification on your phone to accept the debugging notification. NOTE: The following this step will wipe all your data and factory reset your phone. 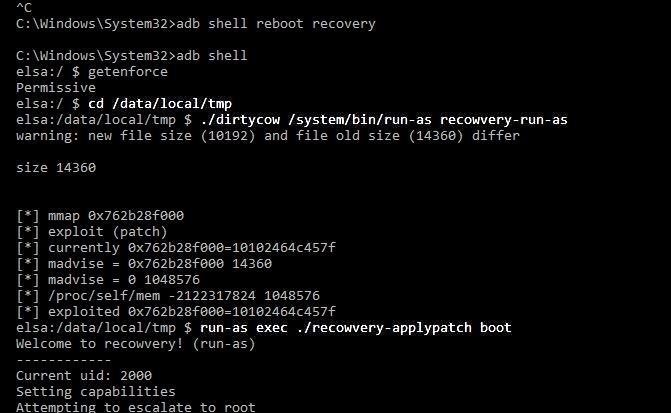 Reboot into Fastboot mode by typing adb reboot bootloader into the ADB shell. 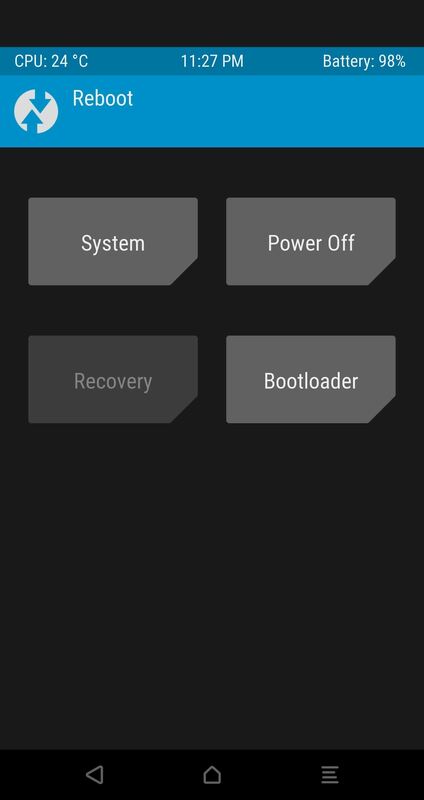 Once your phone is in Bootloader mode, also known as Fastboot mode, type in fastboot oem unlock. 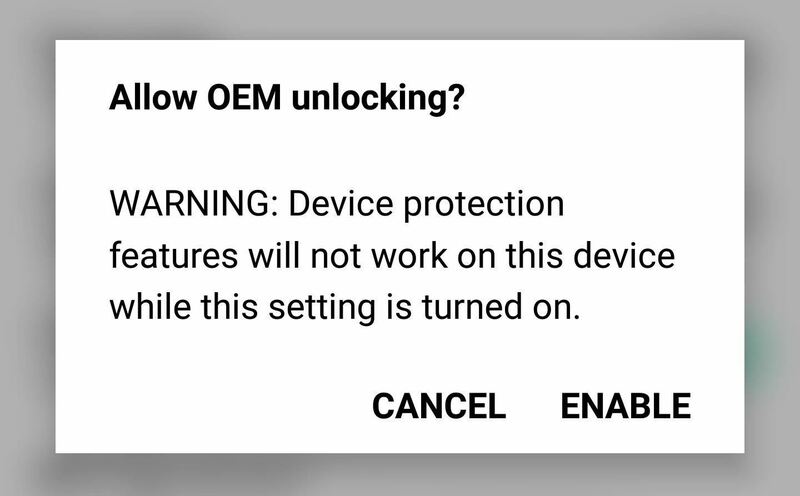 At this point, you should see a message on your phone confirming if you'd like to unlock your bootloader and warning you that, so press your power button to confirm your choice. 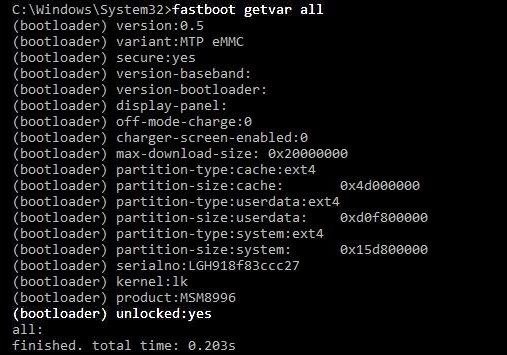 Once you're done with that, check the status of your bootloader lock with the command fastboot getvar all. Make sure it says your bootloader is unlocked, and then boot back into your phone by typing, fastboot reboot. Upon rebooting, you will hit the initial welcome and set-up screen. Skip past as much of it as possible as our goal is to simply gain access to ADB. Then, once you make it to the home screen, repeat Steps 3-8 above to enable USB debugging on your phone again. Now download the four required binaries, custom TWRP, and SuperSU onto your computer using the links below. 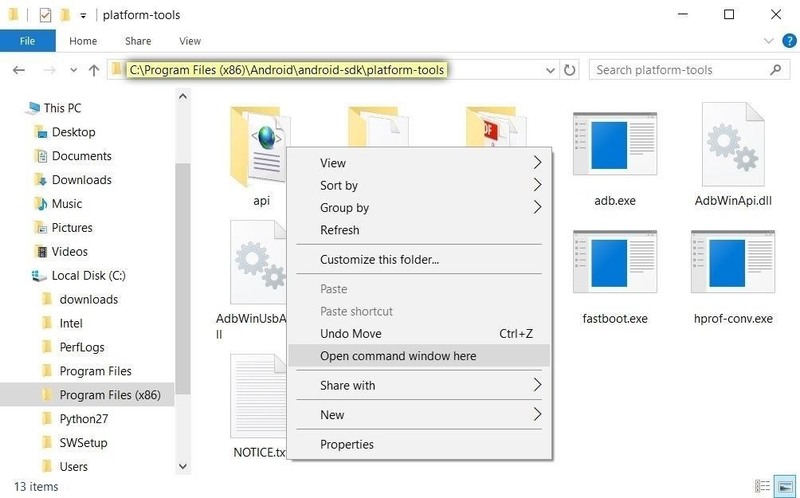 When you're done there, move all of the downloaded files over to the platform-tools folder inside of your ADB and Fastboot installation directory. If you're unsure about the location of this folder, check Step 7 above. NOTE: XDA Senior Member bezeek has put together a one-click utility that will automate steps eleven and twelve. However, I recommend doing it manually as the one-click utility has caused users to bootloop and even brick their devices. Back in the command prompt or terminal window on your computer, copy and paste the commands below one at a time. After each command or group of commands, I'll quickly explain what we just did or when it's important to be patient. The four commands above will place the Dirty COW files on your phone so that we can use them later. Here, we navigated to the directory with the Dirty COW files and allowed read and write permissions. Next up, type the following commands, which will execute the Dirty COW exploit on your phone. With the above command, we have begun the exploitation process. Wait for completion before proceeding. After the above command, your phone will look like it's crashing. Wait for completion before proceeding. Now wait for it to tell you the exploiting was successfully executed. We want to make sure the exploit worked before moving to the next step. Now, before continuing with the following commands, make sure to press CTRL+C on your keyboard. In other programs it used as a copy function, but here, it will end the current process and start a new one. Wait for phone to boot up again. Your recovery will be reverted to stock. It should say "Permissive" on the screen. If it does, we're done with this step! After that, we'll install TWRP custom recovery, which will allow us to make root permanent in a future step. Wait for it to flash your boot image this time. This is flashing a modified boot image with some security features disabled so that we can boot into TWRP after installing it. Here, we just replaced the stock Android recovery with TWRP. If you've made it this far, that means you have successfully booted into TWRP. 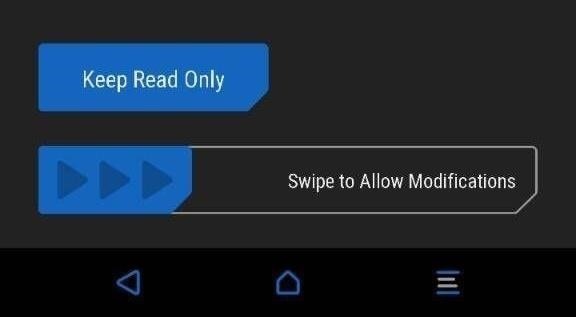 At this point, TWRP will ask you if you want to enable system modifications. Make sure to swipe to allow modifications, otherwise your OS will replace TWRP on the next boot. Next, use the "Format Data" option under the Wipe tab in order to disable device encryption. Type in yes and tap the check mark. 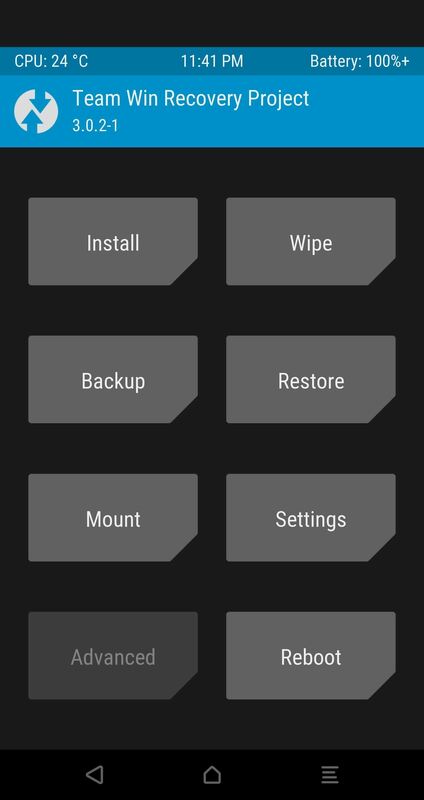 Go back to the main screen of TWRP and open the Reboot tab to select the "Reboot Recovery" option. 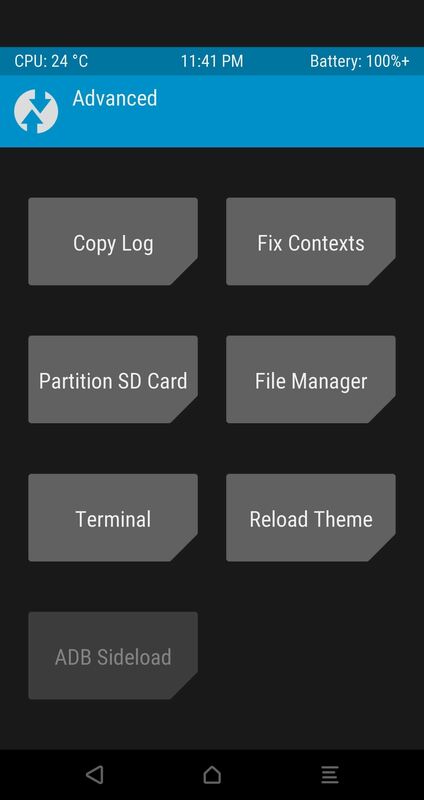 This will reboot you straight back into TWRP with your decrypted phone and allow you to flash the previously-downloaded SuperSU ZIP after you move it to the device or your SD card while in TWRP. 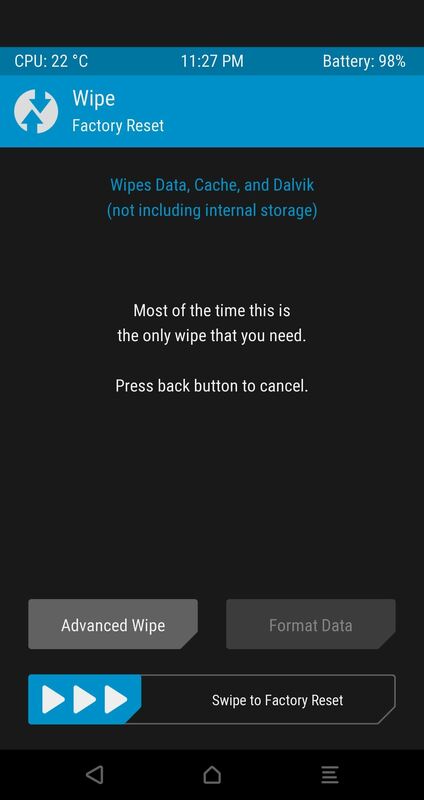 It's time to flash SuperSU in TWRP so that we can keep root active without having to repeat the Dirty COW installation process every time we turn on the phone. In TWRP, open the Advanced tab, select "ADB Sideload", and then Swipe to Start Sideload. Next, find the SuperSU-vXXX.zip file that you pasted into the platform-tools folder back in Step 11, then rename this file to simply SuperSU.zip. Then hit enter to begin the SuperSU installation. 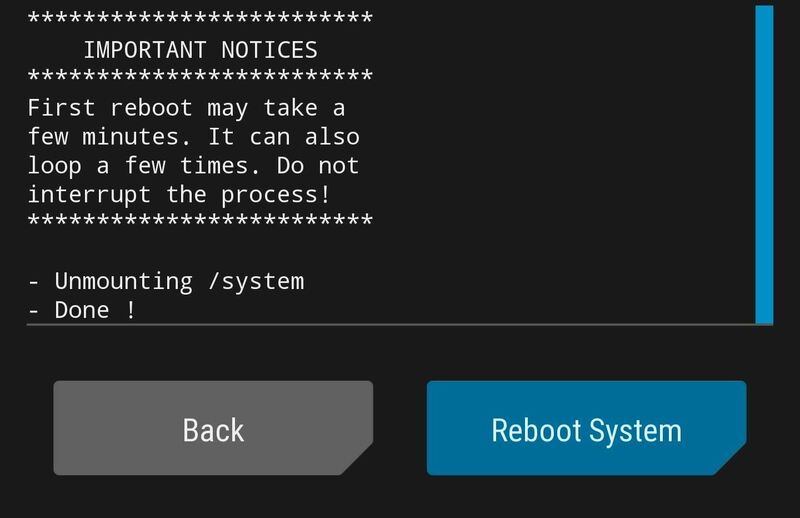 You're all done, hit the "Reboot System" option in TWRP (your phone will reboot a few times due to SuperSU settling down) for a brand new device experience with root! 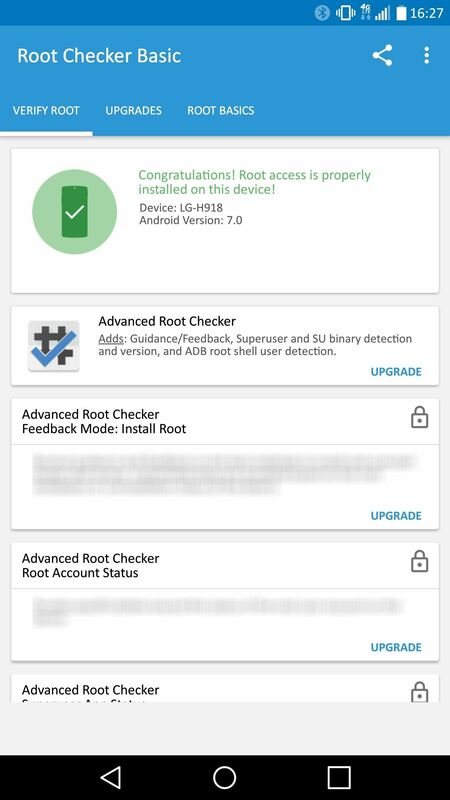 You'll need to set up your phone again, so take care of that, then you'll just need to verify that your phone is properly rooted. To do that, start by installing an app called Root Checker by developer joeykrim. When you first launch the app, a Superuser request will pop up. 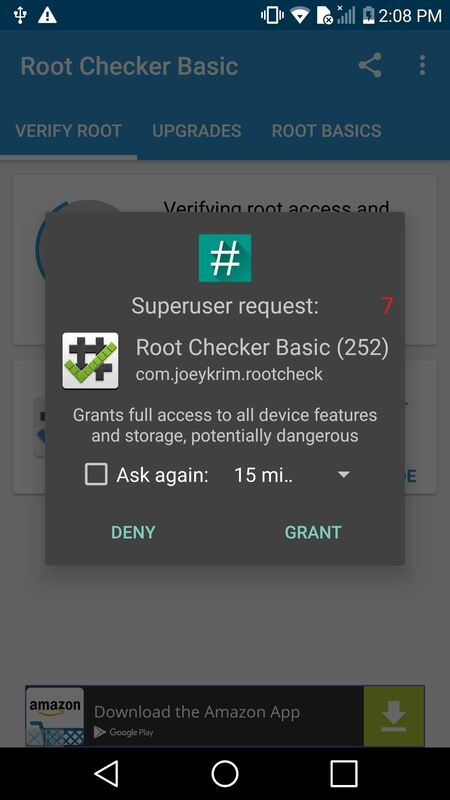 Tap "Grant" here, and Root Checker will verify that you are now rooted. Once you see that green check, that's all there is to it. You're all set to enjoy your rooted LG V20! hey I downloaded the binaries and moved them to the platform tools folder and when i try to push those to my phone using the cmd prompt it somehow says "no such file or directory". can you tell me what could be the reason. you can see that i have those files in the folder. If for some reason you get the same error, type in adb push, click and drag the first file into Command Prompt, then hit enter. If that works, then do the same for the rest. Let me know how it works out. If it still doesn't work, take a screenshot of Command Prompt giving you the error. outstanding write up...I was on the sideline until a member on XDA pointed me here! full root achieved!!!! 6) In TWRP on step (15 or 16) there will be prompt to into password(? ), hit cancel. That's absolutely correct, thanks for pointing it out. ADB and Fastboot are installed systemwide on my laptop, which is why the path suddenly changed (my work laptop died on me in the middle of this article). 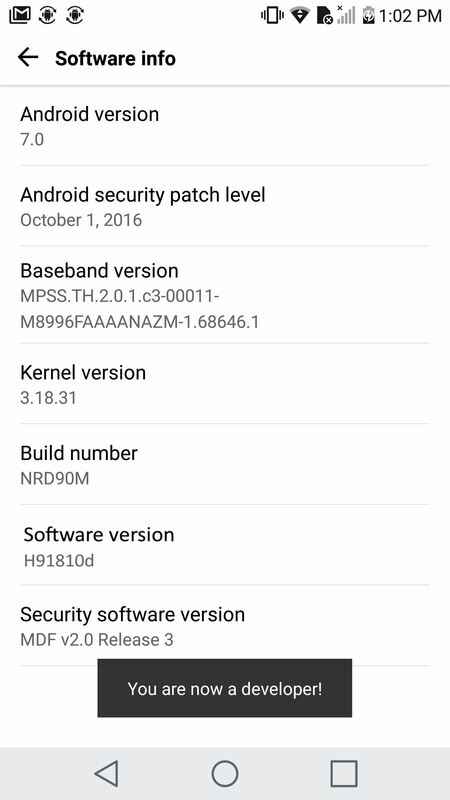 The system of my unrooted H918 was recently automatically updated to H91810k. After the update I can no longer get the phone rooted; it won't pass the logcat -s recowvery step. I could root my phone without any problem before such automatic system update. However the automatic update would always brick the rooted phone. I suspect that the update enhanced the security and thus made the current root method invalid. Hey man, I've got some bad news on that front. The latest TMO security patch renders this root method defunct, Dirty COW has unfortunately been patched. You might have to rollback to an older version and then reroot, but only if the anti-rollback is still at 0. Thanks so much Kevin for your prompt response and confirmation. This method performed on h918_10K was not KEVIN M ? That's correct, you need to be on H918_10J or earlier for this method to work. Hey, thanks for the very detailed guide. I am running into an issue though, when i get to "adb logcat -s recowvery" it just says "Beginning of System" and "Beginning of Main" and then just sits there and does nothing. Iv redone the steps like a dozen times. Any help is super appreciated. i need help what happen?